My dad at the age of 73, passed away peacefully on March 8, 2016 after a hard fought battle with this terrible disease. My dad’s story is textbook pancreatic cancer. He had some minor weight loss, some digestion issues and was sent for a CT scan in early September 2015. Next was the shocker – a diagnosis of stage 4 pancreatic cancer. That was a day I will never forget. My family knew nothing of this disease or the pancreas, my dad was healthy and active why is this happening? The more we researched the more we found out how bad this situation was. All cancer is bad but pancreatic cancer is one of the worst. Very little is known about what causes this cancer, there are no early detection protocols and in almost all cases (90% of the time) once the cancer is detected and diagnosed there is nothing that can be done to cure the situation. Pancreatic cancer has the worst survival rate of any of the major cancers, in the past 40 years there have been no significant improvements in treatment and once the cancer takes hold it spreads incredible quickly and is referred to as the silent killer of cancers. This was all incredibly tough information to digest and process but my dad was tough and was ready to fight as hard and as long as possible. In September we were given the standard outlook 3-6 months. Post diagnosis I remember telling my dad to relax and take it easy. He would have none of that. He wanted to live his normal life for as long as he could. The day after we found out about the cancer my dad went out and cut down a few trees for firewood because that was what he liked to do. Over the next couple of months my dad kept things as normal possible, we had Thanksgiving, we watched lots of the Blue Jays playoff run and got to see one of the games live. We went to London Knights games and spent lots of time to together as a family. At the end of November was when the cancer started to really cause trouble and everything I had read about what this disease does started to happen. My dad was hospitalized for two weeks with just a continuous list of problems because that’s what this cancer does. It just messes with you and causes problems. The hospital stay was the hardest for our family but throughout my dad stayed positive, he wanted to try anything and fight. In the hospital my dad wanted one thing – to get out of the hospital and spend Christmas at home with his grandsons. My dad got his wish and we had a memorable Christmas – the weather even cooperated and my dad was able to get out his tractor one last time. My dad’s final few months where spent at home (in the house he built), we spent lots of time together as a family, my dad caught up with lots of friends, all and all we had some very good times and created some great memories. Back in September when my dad was told 3-6 months… he stretched it as long as he could and made the most of those six months. That’s enough talk about the cancer… my dad’s life ended because of Pancreatic Cancer buts it’s not defined by it. My dad was just an all around great guy and was the best dad. My dad grew up in Toronto, he had an older brother and younger sister. My dad moved to London, Ont., married my mother in 1972 and I was born in 1976. 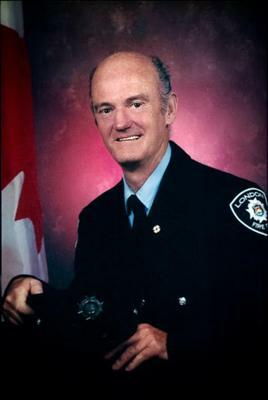 My dad worked for the London Fire Department from 1975 to 2003 retiring as a Captain. During my dad’s career he was very passionate and involved with Health & Safety issues and worked on cases related to firefighter health risks and cancer. In retirement my dad was always busy, he built a house in the country, my parents travelled North America on their camping adventures, lots of fishing trips, playing with his tractors. 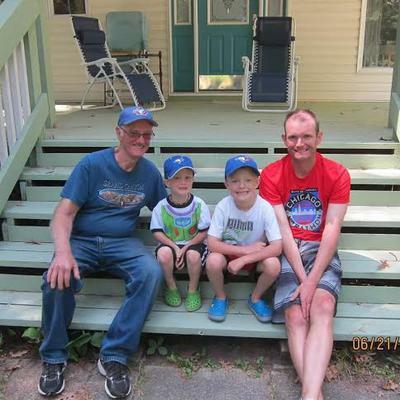 He always had lots of projects on the go, but most of all he always made time for his family and he loved being Grandpa to my boys Tyler and Jack. My dad and I made an incredible team there was nothing that we couldn’t get done together. For the first 20 years of my life my dad was a great dad guiding me and keeping me pointed in the right direction for the next 20 years we developed an incredible bond, he was my dad and also my best friend, we would talk daily and we were always getting together and doing things. My dad was the hardest working and most reliable person. I am incredibly proud of my dad. As busy as our lives got my dad and I would always make time to get together. My fondest memories of my dad are from our fishing trips that started when I was young boy and continued right up until a week before his cancer diagnosis. We had so many great times just me and my dad fishing. This summer I plan on taking the boat (after I get my license and figure out how to drive it because my dad was the captain and that was his thing) and spreading some of his ashes over one of our secret spots. My dad was also an animal lover, over the years my parents had many large dogs, Juno, Trina, Hugo and Harley and one rabbit Bunster. The past six months have been incredibly hard on our family, but as hard as it was we still had some great times and that was one thing we had which was time… there was nothing left unsaid or undone in the end. Even up until the end my dad was focused on making sure his affairs where in order to make things easier for us. My dad and I talked a lot over the past months about this cancer and what happened. My dad never blamed anyone, got angry, he just dealt with it and made the best of it. Very little is known what causes Pancreatic Cancer so in my dad’s case we will never know. But my dad did want his story told and his wish was that more resources are directed towards this cancer to raise awareness and research earlier detection protocols. My dad lived 73 years but he made the most of his time and accomplished a lot, he had no regrets and did everything he wanted. My family is going to really miss him… Love You Dad… gone but never forgotten. My heart aches for the grief and loss you are experiencing right now... please know our prayers are with you and your family as you walk this difficult road. You spoke such truth. I wish I had known your dad. "A life ended because of Pancreatic Cancer but not defined by it..." What a legacy to leave behind for those we love.